To avoid staining your pool, using only a “Swimming Pool Dye Kit” is highly recommended. We have seen too many examples where food coloring, phenol red, ink, etc created a more expensive repair than the leak because of staining dyes. Click the dye kit image to purchase the “Swimming Pool Dye Kit”. Find A Leak: Now that you have identified that the pool is leaking and narrowed the search to either the shell, or piping/system, follow these steps to find the Leak. Vinyl Liners - Look for tears or separations around all fittings: skimmer, returns, cleaner line, etc. Pay close attention to steps and corners, where the liner may be stretched more than normal. If an animal had the misfortune to fall into your pool you may notice claw marks (tears) just below the water line. Spending time under water with a mask may be required to find a small leak in the liner. When liners become old they may have many pinhole leaks. There can always be more than one leak. Shell of the pool - Turn off the pump at least an hour before you do this. In a concrete pool, visually inspect the tile line, skimmer, steps, lights and returns, many times cracks in the shell are obvious. 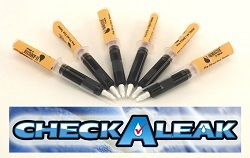 Use an approved Dye Test Kit to avoid staining. By using the syringe near the crack, you will see the crack pull the dye in. That will show you where the pool is leaking. If there are no visible cracks, you will want to apply the Dye around any of the items that pierce the shell of the pool (main drain, returns, lights, etc.). Be sure to check the "mouth" of the skimmer where the plastic of the skimmer meets the concrete. This area is very susceptible to movement and often separates causing a leak. The other most common location of leaks are around the tile line of the pool and behind the pool light. If your leak is in the system/piping: Look closely at the filter, pump, heater, and valves. Check the ground for moisture. Turn the pump on and off looking closely for spraying water when the pump is turned off. Some leaks are not detectable using the suggestions above: If that is the case, it might be time to call a professional! Thanks to state-of-the-art technology, most pool or spa leaks can be found and repaired without major disruption. Some of the methods used are: Compressed air is used to pressurize a pipe. The air displaces the water in the pipe until it reaches the leak, at which point bubbles escape from the hole to reveal the problem area. Or, where a pipe fails to maintain a constant air pressure, a leak exists. Special television camera that is snaked through plumbing pipes to spot leaks. By injecting air into a pipe, then listening electronically for sounds of air escaping with a super sensitive microphone. If these types of leaks exist, it is beyond the scope of this DIY guide.